3.4.9.10 This interpretation establishes the accounting and financial reporting requirements for risk management activities of local governments. It implements the Governmental Accounting Standards Board (GASB), Statement 10, Accounting and Financial Reporting for Risk Financing and Related Insurance Issues, as amended by GASB Statement 30, Risk Financing Omnibus, GASB Interpretation 4, Accounting and Financial Reporting for Capitalization Contributions to Public Entity Risk Pools, and Chapter 48.62 RCW. Unless otherwise noted, this section applies to all self insurance arrangements including property and liability (i.e., property and casualty), health and welfare (medical, dental, etc. ), unemployment, and industrial insurance. 3.4.9.20 The GASB Statement 10 and Interpretation 4 prescribe the accounting standards for risk financing and related insurance issues. 3.4.9.30 A discussion related to transfer of risk is included in GASB Statement 10, paragraphs 7-9 and should be considered for each program. 3.4.9.40 A capitalization contribution to a public entity risk pool WITH transfer or pooling of risk should be reported as a deposit if it is probable that the contribution will be returned to the entity upon either the dissolution of or the approved withdrawal from the pool. An entity’s determination that the return of the contribution is probable should be based on the provisions of the pooling agreement and an evaluation of the pool’s financial capacity to return the contribution. In governmental funds, fund balance should be classified as nonspendable to indicate that the deposit is not appropriable for expenditures. In governmental funds, the entire amount of the capitalization contribution may be recognized as expenditure in the period of the contribution; reporting of prepaid insurance is not required. Otherwise the contribution should be reported initially as prepaid insurance (an asset), and expenditures should be allocated and recognized over the periods for which the pool is expected to provide coverage. If prepaid insurance is reported, fund balance should be classified as nonspendable to indicate that the amount is not appropriable for expenditures. In proprietary funds, the contribution should be reported initially as prepaid insurance (an asset), and expenses should be allocated and recognized over the periods for which the pool is expected to provide coverage. In both cases, the periods expected to be covered should be consistent with the periods for which the contribution is factored into the pool’s determination of premiums but should not exceed ten years if is not readily determinable. 3.4.9.60 A capitalization contribution to a public entity risk pool WITHOUT transfer or pooling of risk should be reported as a deposit or a reduction of claims liabilities. Information available before the financial statements are issued indicates that it is probable that an asset has been impaired or a liability has been incurred at the date of the financial statements. It is implicit in this condition that it must be probable that one or more future events will also occur, confirming the fact of the loss. 3.4.9.90 1. If the general fund is used, accounting and reporting must be on the modified accrual basis of accounting. 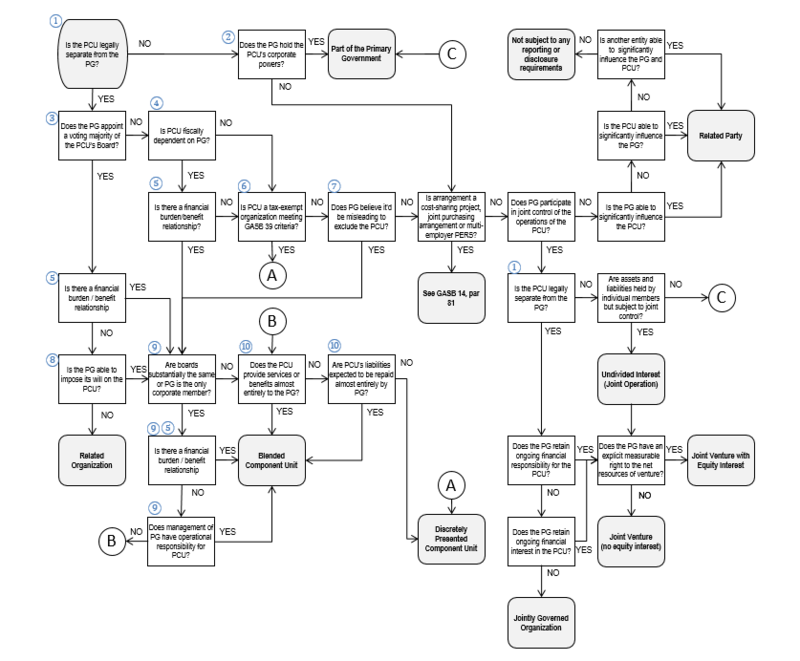 The entity may use any method it chooses to allocate loss expenditures/expenses to the other funds of the entity. However, if the total amount charged to the other funds, (including the general fund itself) exceeds total expenditures and liabilities, the excess amounts should be reported as transfers. Transactions that constitute reimbursements of a fund for expenditures/expenses initially made from it that are properly applicable to another fund should be reported as expenditures/expenses in the reimbursing fund and as reductions of the expenditure/expense in the fund that is reimbursed. 3.4.9.100 2. If an internal service fund is used, accounting and reporting must be on the full accrual basis of accounting. The internal service fund should recognize both current and long-term claims expenses and liabilities for its risk financing activities within the fund. b. The total charge by the internal service fund to the other funds is based on an actuarial method or historical cost information and adjusted over a reasonable period of time so that internal service fund revenues and expenses are approximately equal. c. In addition to (2) above, the total charge by the internal service fund to the other funds may also include a reasonable provision for expected future catastrophe losses. Charges made in accordance with the foregoing provisions should be recognized as revenue by the internal service fund and as expenditures/expenses by the other funds of the entity. Deficits, if any, in the internal service fund resulting from the application of (2) and (3) above do not need to be charged back to the other funds in any one year, as long as adjustments are made over a reasonable period of time; however, a deficit fund balance of the internal service fund should be disclosed in the notes to financial statements. If the charge by the internal service fund to the other funds is greater than the amount resulting from the application of (1) through (3) above, the excess should be reported in both the internal service fund and the other funds as a transfer. If the charge by the internal service fund to the other funds fails to recover the full cost of claims over a reasonable period of time, any deficit fund balance in the internal service fund should be charged back to the other funds and reported as an expenditure/expense of those funds. a. Probable. The future event or events are likely to occur. b. Reasonably possible. The chance of the future event or events occurring is more than remote, but less than likely. c. Remote. The chance of the future event or events occurring is slight. 3.4.9.120 If a claim is asserted and the probable loss is reasonably estimable, the expenditure/expense and liability should be recognized in the financial statements. Incidents often occur before the end of the accounting period where claims are not reported or asserted when the financial statements are prepared. If an incurred but not reported (IBNR) loss can be reasonably estimated, and it is probable that a claim will be asserted, the expenditure/expense and liability should be recognized. 3.4.9.130 Financial statement footnote disclosure should be made for any contingent liability for claims when there is at least a reasonable possibility that a loss may have been incurred. This disclosure would indicate the nature of the contingency and should give an estimate of the possible loss or range of loss, or state that such an estimate cannot be made. 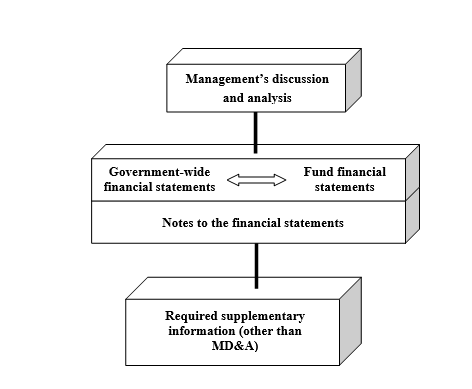 Financial statement footnote disclosure is not required for a loss contingency involving an unreported claim or assessment if there has been no manifestation by a potential claimant of an awareness of a possible claim or assessment unless it is considered probable that a claim will be asserted and there is a reasonable possibility that the outcome will be unfavorable. 3.4.9.140 The financial statement disclosures may be made for the entity as a whole. However, there may be circumstances when aggregate disclosures are misleading. In those circumstances, additional or separate presentation should be made by fund or by fund type. In addition, there may be circumstances under which disclosures by fund or by fund type may provide more useful information than disclosures presented in the aggregate. Specific Illustrative Examples of disclosures are provided in Appendix D to GASB Statements 10 and 30. 3.4.9.150 If a pool included in the oversight entity’s financial report issues its own separate report, the report should emphasize oversight entity disclosures about its participation in a pool and provide reference to the separate report of the pool. 3.4.9.160 Component units that participate in their oversight entity’s risk management internal service fund should make the disclosures required above in their separately issued component unit financial statements. The component unit should also disclose the fact that the unit participates in the fund, including a description of the nature of that participation, and state the rights and responsibilities of both the unit and the oversight entity. 3.4.9.170 The following section describes additional reporting for entities engaged in self-insurance or self-funding as well as risk assumption. These reporting requirements are not applicable if the only risk financed or assumed is an annual deductible of a purchased insurance policy. Members of public entity risk pools are not required to report risks transferred to the pool but are required to report all other retained risk(s). 3.4.9.180 Report to State Auditor’s Office by Local Governments which Individually Assume Risk or Self-Insure. This section establishes reporting requirement for all local governmental entities which individually self-insure (with a formal risk financing plan) or assume risk (without a formal risk financing plan). Report must be submitted to the State Auditor’s Office each year as part of the government’s annual report. The information which must be included in this report is defined in Schedule 21, Risk Management. 3.4.9.190 Report to State Auditor’s Office by Entities which Provide Insurance Coverage or Claims Servicing to Others. This section establishes annual reporting requirements for all entities organized under Chapter 48.62 RCW which provides insurance coverage (with or without claims servicing) to pool members or others (aka joint programs). This requirement applies to both stand-alone public entity risk pools and programs which are part of a parent entity. Report must be submitted to the State Auditor’s Office each year as part of the government’s annual report. The information which must be included in this report is defined in Schedule 21, Risk Management. a. If an entity provides insurance or risk management coverage separate from its own risk management activities to individuals or organizations outside the governmental reporting entity and there is material transfer or pooling of risk among the participants, that activity should be accounted for as a public entity risk pool. The governmental reporting entity is the oversight unit, and all related component units, if any, must be combined in accordance with the GASB Codification Section 2100, Defining the Financial Reporting Entity. b. If an entity provides risk transfer or pooling coverage combined with its own risk management activities to individuals or organizations outside its reporting entity, those activities should continue to be reported in the general fund or an internal service fund only as long as the entity is the predominant participant in the fund. If the entity is not the predominant participant in the fund, then the combined activities should be reported as a public entity risk pool using an enterprise fund. c. If an entity performs claims-servicing functions, not insurance functions, for individuals or organizations that are not a part of the governmental reporting entity, amounts collected or due from those individuals or organizations and paid or to be paid to settle claims should be reported as an asset or liability on an accrual basis, as appropriate. The operating statement should report claims-servicing revenue and administrative costs from these activities.